Mueller and Hinton developed Mueller Hinton Agar (MHA) in 1941 for the isolation of pathogenic Neisseria species. Nowadays, it is more commonly used for the routine susceptibility testing of non-fastidious microorganism by the Kirby-Bauer disk diffusion technique. Mueller Hinton Media contains Beef Extract, Acid Hydrolysate of Casein, Starch and Agar. Beef Extract and Acid Hydrolysate of Casein provide nitrogen, vitamins, carbon, amino acids, sulphur and other essential nutrients. Starch is added to absorb any toxic metabolites produced. Starch hydrolysis yields dextrose, which serves as a source of energy. Agar is the solidifying agent. The use of a suitable medium for testing the susceptibility of microorganisms to sulfonamides and trimethoprim is essential. Antagonism to sulfonamide activity is demonstrated by para-aminobenzoic acid (PABA) and its analogs. Reduced activity of trimethoprim, resulting in smaller inhibition zones and innerzonal colonies, is demonstrated on unsuitable Mueller Hinton medium possessing high levels of thymidine. Both the PABA and thymine/thymidine content in Mueller Hinton Agar are reduced to a minimum, thus markedly reducing the inactivation of sulfonamides and trimethoprim when the media is used for testing the susceptibility of bacterial isolates to these antimicrobics. 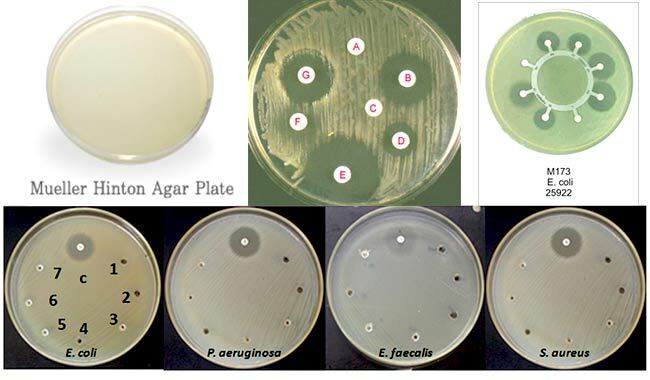 The major use of Mueller Hinton Agar is for antimicrobial susceptibility testing. It has become the standard medium for the Bauer Kirby method and its performance is specified by the NCCLS. It is specified in FDA Bacteriological Analytical Manual for food testing, and procedures commonly performed on aerobic and facultative anaerobic bacteria. Why MHA is used for antibiotic susceptibility testing? It is a non-selective, non-differential medium. This means that almost all organisms plated on here will grow. It contains starch. Starch is known to absorb toxins released from bacteria, so that they cannot interfere with the antibiotics. It also mediates the rate of diffusion of the antibiotics through the agar. MHA shows acceptable batch-to-batch reproducibility for susceptibility testing. MHA is low in sulfonamide, trimethoprim, and tetracycline inhibitors (i.e. concentration of inhibitors thymidine and thymine is low in MHA). Both the para-aminobenzoic acid (PABA) and thymine/thymidine content in Mueller Hinton Agar are reduced to a minimum, thus markedly reducing the inactivation of sulfonamides and trimethoprim when the media is used for testing the susceptibility of bacterial isolates to these antimicrobics. Suspend 38 gm of the medium in one liter of distilled water. Pour cooled Mueller Hinton Agar into sterile petri dishes on a level, horizontal surface to give uniform depth. Check for the final pH 7.3 ± 0.1 at 25ºC. Store the plates at 2-8 ºC. Numerous factors can affect results: inoculum size, rate of growth, medium formulation and pH. Strict adherence to protocol is required to ensure reliable results. Drug inactivation may result from the prolonged incubation times required by slow growers. Variation in the concentration of divalent cations, primarily calcium and magnesium affects result of aminoglycoside, tetracycline, and colistin test with P. aeruginosa isolates. amazing work, is it possible to use mueller hinton broth for MIC determination ? I Went through your note, please let me know how much quantity of MH media pour in to each plate. hlow sir, i just want to know how starch works in MH MEDIUM to absorb toxins and it gives protection to what?